defense sequences often last only a few seconds, have convinced me that I still learn and teach them today. For many years now I have been teaching in the security and executive sector and have had many years of experience. We are working on our self-defense training that is oriented around the needs of today - and what our students bring with them. To bring literally: pen, key, umbrella, brush, belt and scarf; these are all useful weapons, if you know how to use them. Especially the security umbrella is ideal for this! I have tested this umbrella very strenuously with my assistant and can say "top quality". It is inconspicuous, but very effective, if one uses it for self-protection. 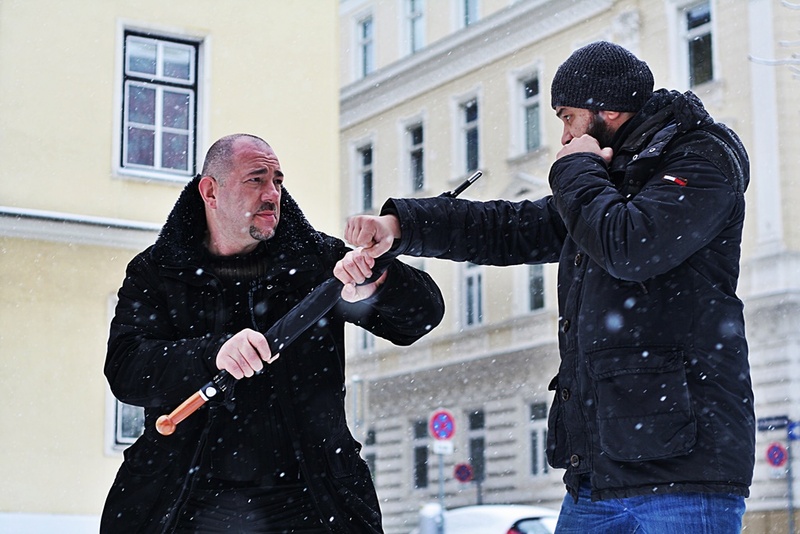 The umbrella has become so popular in our training that the half-stick is used more often. Also from my side a big compliment to Mr. Spannbauer and his team.